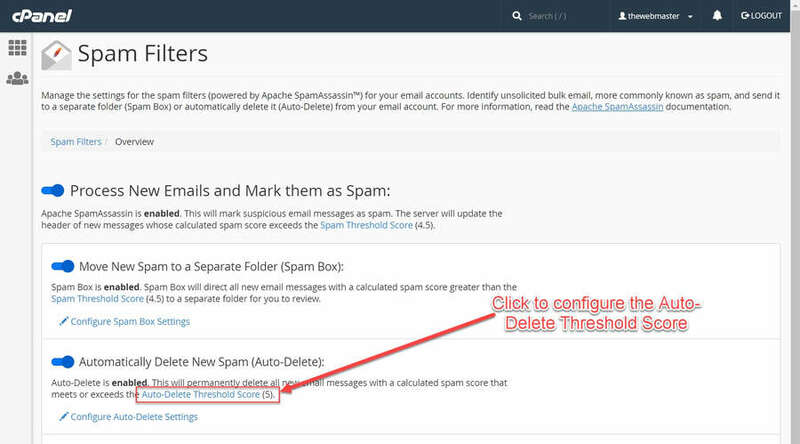 How to configure Apache SpamAssassin within cPanel including a detailed guide to all the Spam Filter settings, including SpamAssassin Score. Now you can easily stop email spam! Last updated: Jan 10, 2019. 11:10 UTC. If you are having problems with email spam, whether it be the occasional promotional mail, or 100’s or even thousands of emails spamming your inbox each hour, Email Spam Protection can help. SpamAssassin is an open source Apache Project and is located in cPanel under the Spam Filter settings. The source was first made widely available back in April 2001. If you are more technically-minded and want to see how it has evolved over the years, you can see a full change history here. These spam detection methods are applied to email headers (an excellent guide to finding email headers) and content to classify the email using various statistical methods. They are designed to block unwanted email messages before they reach your inbox and evolve to combat the changing ways spammers get to your inbox. It is a far cry from the keyword based spam detection systems used prior. 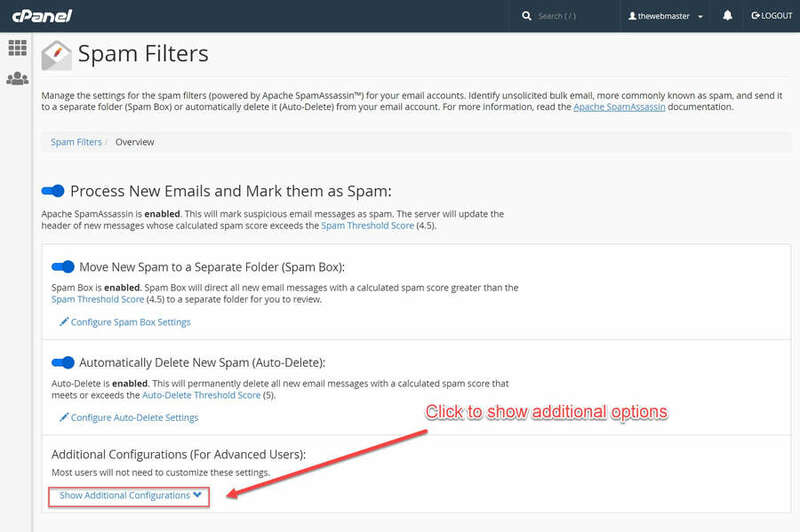 I will first go through a short cPanel tutorial showing how to enable the Spam Filter and then go through the different SpamAssassin configuration options. In the cPanel Dashboard scroll down to the ‘Email’ Section. I am assuming you have already logged in to cPanel, but if you haven’t yet, please do so now. Scroll down to the “Email” section of the administrative dashboard. In the cPanel Dashboard scroll down to the 'Email' Section. © The Webmaster. Click the ‘Spam Filters’ link. 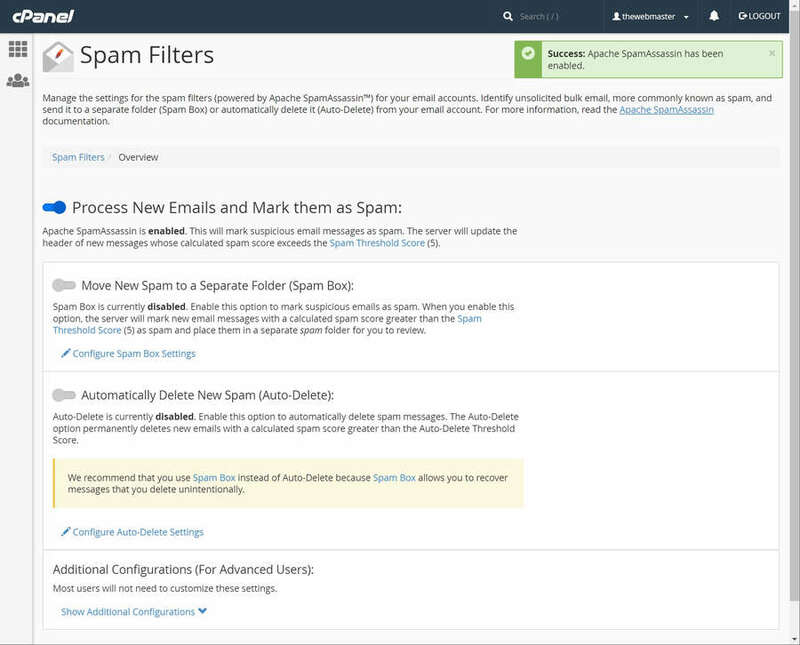 As of version 70 of cPanel, Apache SpamAssassin was renamed to “Spam Filters” in the dashboard. Click the 'Spam Filters' link. © The Webmaster. 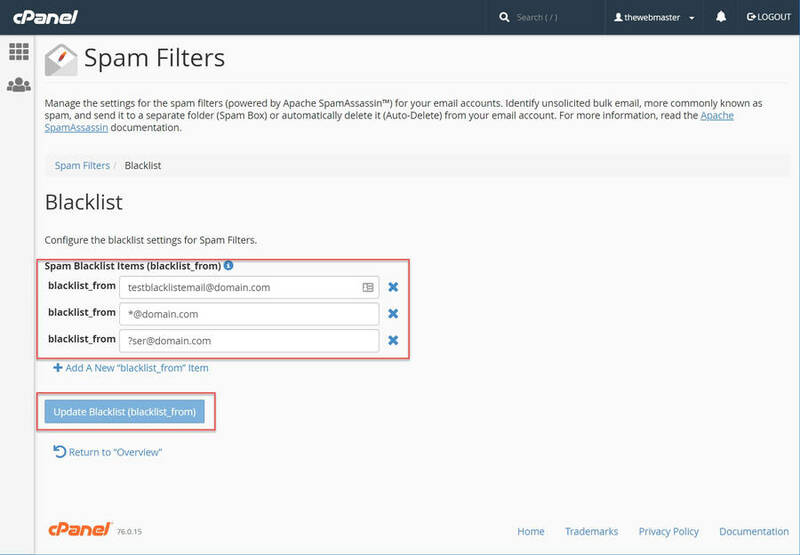 Turn on the Spam Filters by toggling the “Process New Emails and Mark them as Spam” option at the top of the page. Enable the Spam Filters © The Webmaster. Success: Apache SpamAssassin has been enabled. SpamAssassin is now active © The Webmaster. At this stage, all you have done is enable the Spam Filter. When emails are received by you, messages with a score of 5 (default score) will be marked as spam. Marked as spam. © Screenshot. 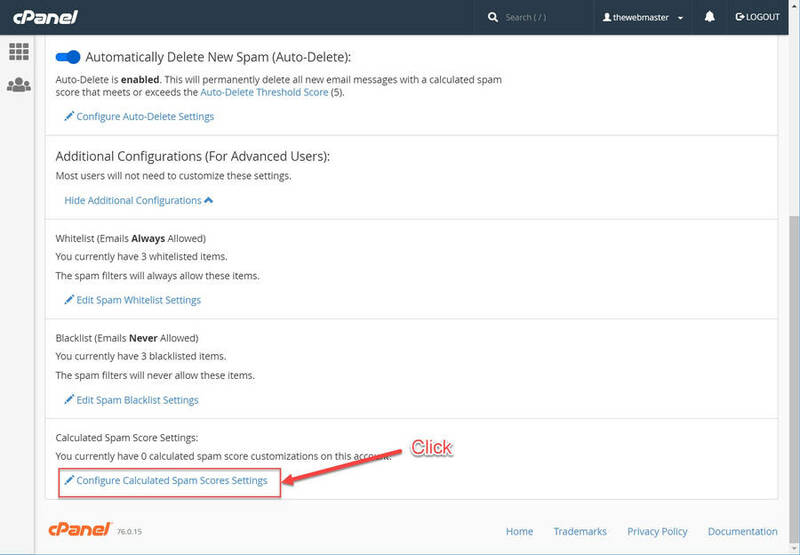 Unless you configure SpamAssassin to auto-delete or move the spam to the junk folder (I’ll cover how to do this shortly), No other actions will occur, and the message will remain in your inbox. An email message spam score is calculated on a scale of 1 to 10. The higher the SpamAssassin Score, the more likely it is to be spam. If a message’s calculated spam score meets or exceeds the Spam Threshold Score, the system will label that message as spam. The Spam Threshold Score and Auto-Delete Threshold Score (I’ll cover this shortly) are different, and as such do not affect each other. Click the 'Spam Filters' link on the main cPanel dashboard © The Webmaster. To Adjust the Score, you will need to click on the “Spam Threshold” link as shown in the screenshot. Click on the 'Spam Threshold Score' link © The Webmaster. Score 1: Aggressive - This will mark many legitimate emails as spam. I.e., Many false positives. Score 10: Passive. This will catch only the most obvious spam. Custom Score: Any score between 1 and 10, configurable to two decimal places. 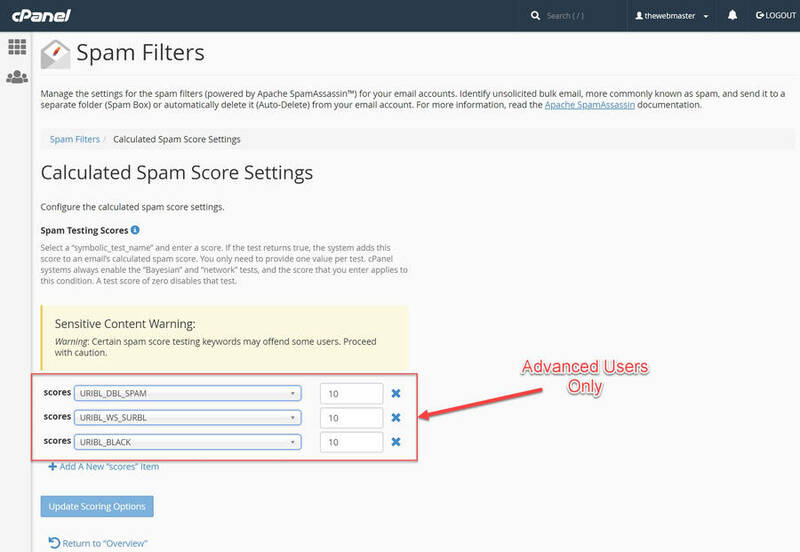 This enables you to fine-tune the SpamAssassin Score setting if you continue to receive Spam emails. I recommend keeping the Score at the Default level, and only adjust it if you still have a problem with spam emails. Lower the score if you find Spam emails are still making it through the filter. Raise your score if you find that emails from your contacts are being filtered by mistake. Once you have changed your score, click “Update Scoring Options” to save it. Adjust the Spam Threshold Score to your desired level © The Webmaster. When Apache SpamAssassin is enabled, you may want to move spam to a different folder. By enabling this option, any message above the Spam Threshold Score will be automatically moved into the “Spam” folder. You can then review the spam messages and adjust the Spam Threshold Score as necessary to fine tune it. Everything should now be set up. Toggle the 'Move New Spam to a Separate Folder (Spam Box)' option © The Webmaster. 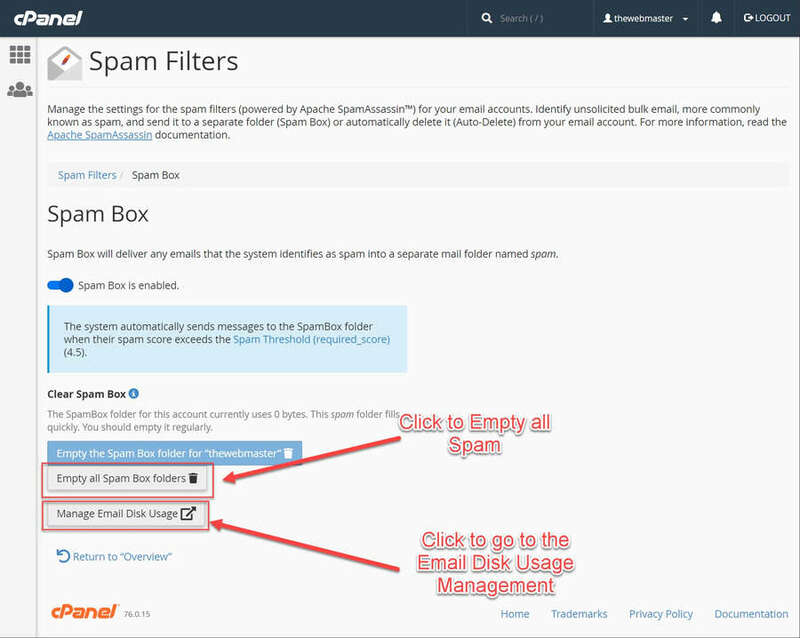 This is an optional step that covers the additional options available for the Spam Box. I say optional because all it really does is allow you to easily empty the Spam box, either in its entirety or by deleting individual messages. To search for specific spam messages, or delete by certain characteristics, click on the “Manage Email Disk Usage” option. You will then be able to manage disk usage, including the Junk Folder. Configure Spam Box Settings © The Webmaster. No email filtering system is 100 percent perfect (you can read an interesting discussion on the StackExchange about that here). While spam filters try to catch all email that is spam, Spammers are continually adapting to create emails that are trusted not to be spam both by automatic filters and by humans themselves. For spammers, they try to create emails that can bypass the filters, looks legitimate, so it is opened, and look attractive enough so that a user clicks a link in the mail. It is a continuous battle. As a result of the imperfection of email filters, I recommend that you do not use the auto-delete option unless you have to. 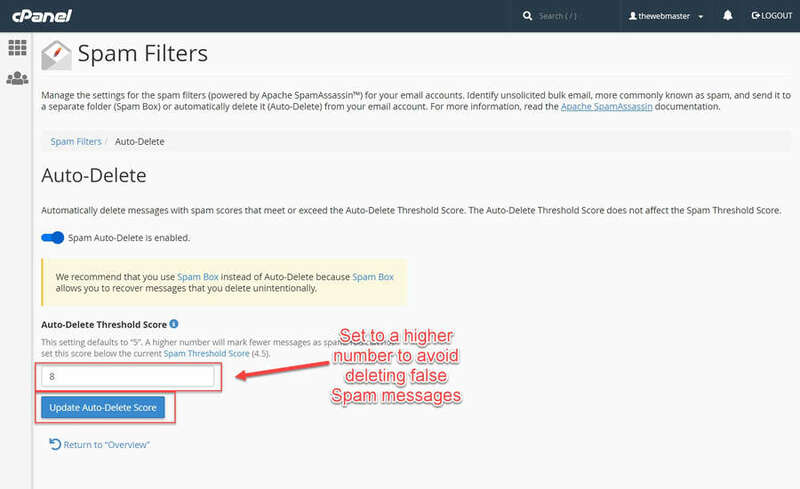 If you are having a particular problem with email spam, you can set the auto-delete score to be higher than the spam score. This way, you can still set the spam filter to be quite strict, and only delete the very worst spam. 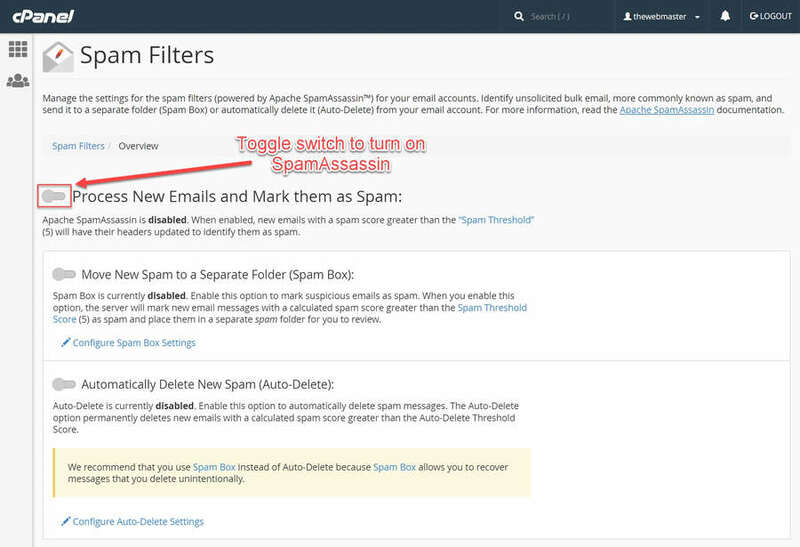 Toggle the ‘Automatically Delete New Spam (Auto-Delete)’ option. 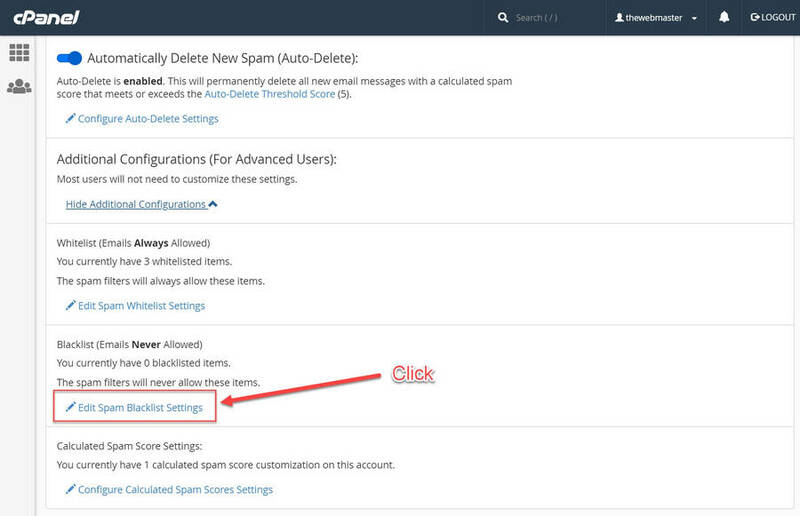 To automatically delete spam messages above the Auto-Delete Threshold Score (this is different from the Spam Threshold Score) toggle the ‘Automatically Delete New Spam (Auto-Delete)’ setting. 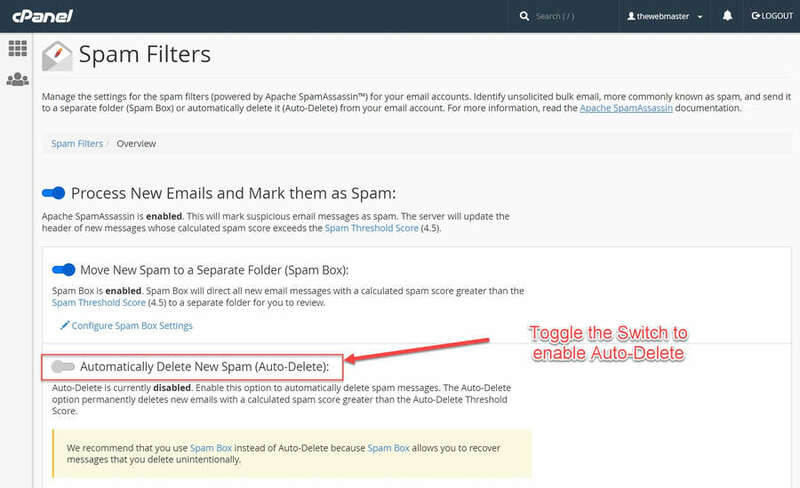 Toggle the 'Automatically Delete New Spam (Auto-Delete)' option. © The Webmaster. Click the ‘Auto-Delete Threshold Score’ Link. Click the link from the Main Spam Filters screen to go to the settings. Click the 'Auto-Delete Threshold Score' Link. © The Webmaster. As I mentioned earlier, it is not recommended to use the Auto-Delete functionality. However, if you do, then I highly recommend setting the score much higher than the Spam Threshold Score, so you only delete the very worst of the Spam Messages. The Default Auto-Delete Score is set to 5. I recommend a setting of 8 if you use this functionality. Click the “Update Auto-Delete Score” to save the setting. Set Auto-Delete to 8 © The Webmaster. If you have an important client, friend, or just want to ensure you will receive a specific sender’s email, you need to whitelist their domain. Toggle the ‘Additional Configurations (for Advanced Users)’. To see the full list of Additional configurations, you need to expand the list by clicking the “Show Additional Configurations” link. Toggle the 'Additional Configurations (for Advanced Users)'. © The Webmaster. Click the ‘Edit Spam Whitelist Settings’ Link. 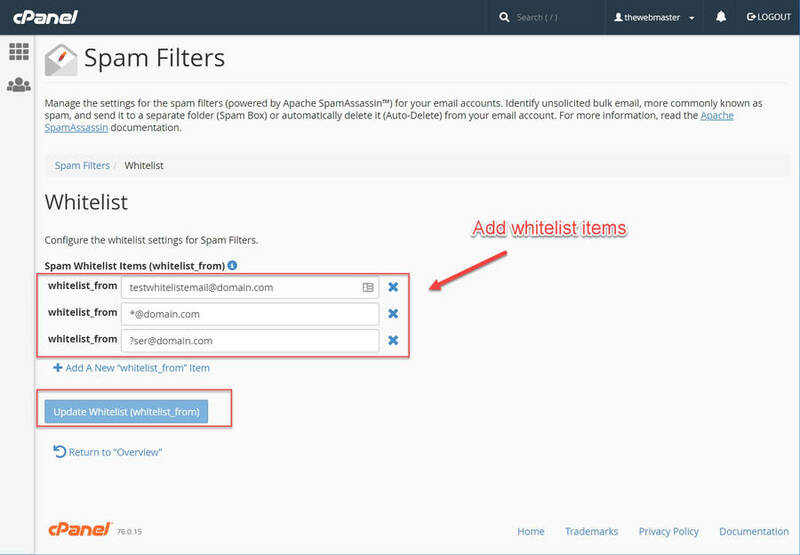 Click the link to Edit the Spam Whitelist Settings. Click the 'Edit Spam Whitelist Settings' Link. © The Webmaster. ?ser@example.com — Whitelists a single character in the email address. So in this example, user@example.com would be allowed, but thisuser@example.com would not. Once you have entered your whitelist_from item, you can either add more or click the “Update Whitelist (whitelist_from)” button. Add a New Whitelist From Item (whitelist_from) © The Webmaster. If you get repeated spam from any particular email address, such as a mailing list you cannot unsubscribe from, you can blacklist that domain. Click the ‘Edit Spam Blacklist Settings’ Link. Click the link to Edit the Spam Blacklist Settings. Click the 'Edit Spam Blacklist Settings' Link. © The Webmaster. ?ser@example.com — Blacklists a single character in the email address. So in this example, user@example.com would be allowed, but thisuser@example.com would not. Once you have entered your Blacklists_from item, you can either add more or click the “Update Blacklist (blacklist_from)” button. Add a New Blacklist From Item (blacklist_from) © The Webmaster. This is where you can configure different scores for the hundreds of different tests and assign a score to that test. 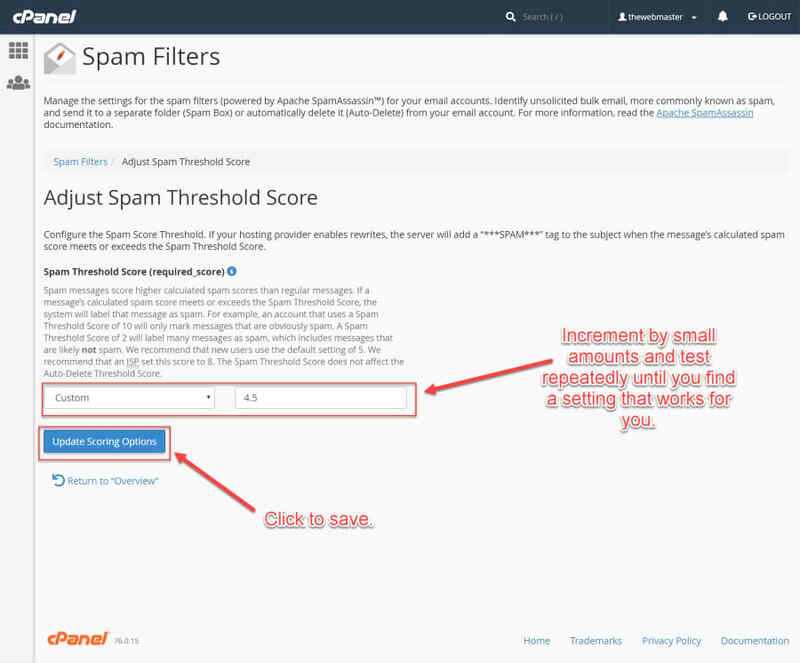 For example, you can check popular spam email lists, and set “10” score to the Calculated Spam Score to ensure any email caught by that test is always caught by your Spam Filter. I do not recommend you change any of these settings, but I will walk you through a couple that you may wish to consider if you have a particularly bad problem with spam. Click the ‘Configure Calculated Spam Score Settings’ Link. Click the 'Configure Calculated Spam Score Settings' Link. © The Webmaster. You can also see the default scores by adding any of the Scores Items, as the score when added will be the default one unless you change it. URIBL_BLACK: Set Score to 10 - This list contains domain names belonging to and used by spammers. This list has a goal of zero False Positives. I recommend only using these revised settings if you have a particular problem with spam (my default recommendation is that no changes should be made). Also, I recommend monitoring your Junk Folder for any false positives after implementation. Add a New 'Scores' Item © The Webmaster.